Happy Black Friday! Are you still awake? Online shopping is the way to go! Today's FFF over at The Greeting Farm is a color challenge (Baby Blue/Silver/White). Here is the card I created for you. The birdhouse image is from the My Heart 6x9 stamp set. I didn't have an image for the base, so i had hoarded some pieces of cling rubber that were leftover trimmings of TGF stamps, and used a long narrow piece as the pole. 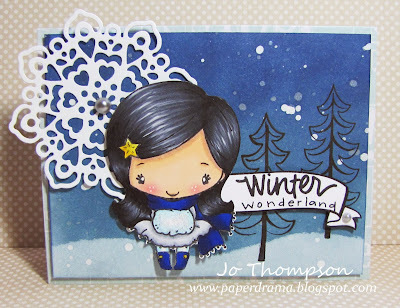 I used the same technique that I used on my previous "Let it Snow" card here. I blended two Distress Ink colors together for the background, not taking it all the way to the bottom so that it can remain white for the snow. 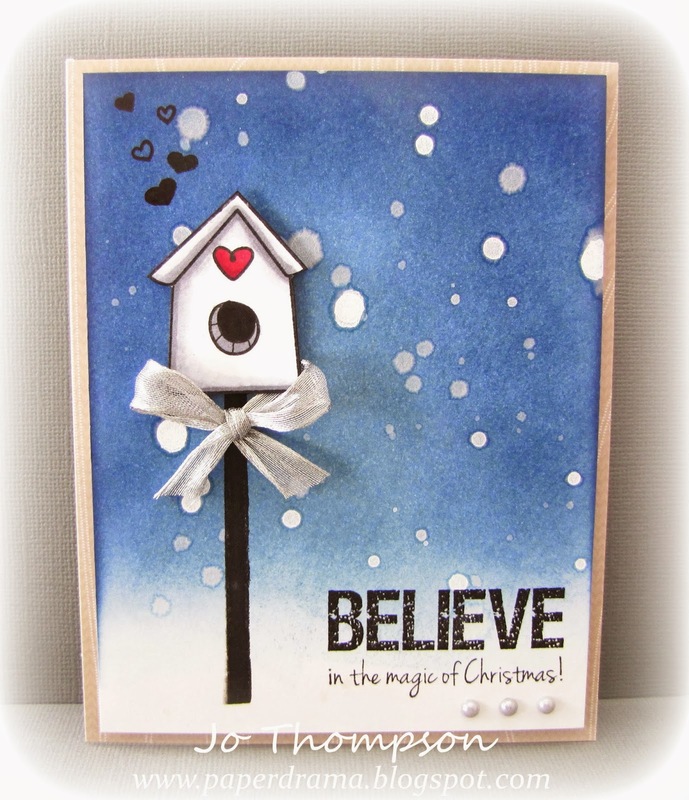 For the snow effect, I used two white tone mists from Lindy's Stamp Gang and created droplets to mimic snow. Here is a mini video of myself creating this background. For the silver requirement for this color challenge, I had some 1/2" wired silver mesh ribbon and some mini silver flat back pearls. 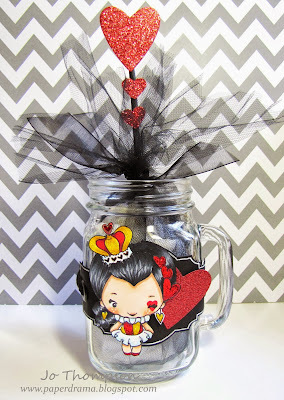 Hope you enjoyed my card and come play along with us over at the TGF Blog. Let it snow, Let it snow! is this Farm Fresh Friday challenge over at The Greeting Farm. Your project must contain either snowflakes, snow, a snowman, snowballs...you get the picture. Here is my card featuring the NEW Exclusive TGF Snowflake Die and Holiday Anya 3. I created a snow scene in the background with Distress Ink colors for the night sky, white toned mists, and a tree image. The snow bank on the card is used with a make shift stencil that I cut from copy paper and a white chalk ink. The fallin snow is created by unscrewing the mist sprays and tapping on the flutes to create different sized droplets. I like the effect of the two different white tones, one is more opaque than the other to give dimension. The Anya image and sentiment are both on dimensional pop dots, as well as the actually snow scene. I added some silver flat back pearls and Stickles for the sparkle & bling. This card was fun to put together and it makes a perfect winter/holiday card. Thanks for stopping by, come join us on this challenge over at the TGF Blog. GOOD LUCK!! Have a sunshine-y day! You've asked for it….we've listened! 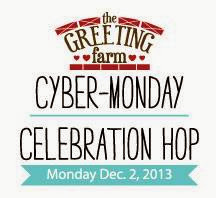 TGF is excited to be sponsoring a fun Cyber Monday event! Since a lot of you will be online shopping anyway (and good for you for avoiding the crowds, haha! : ), why not head on over to the TGF BLOG for some fun, holiday cheer! We are waiting until December rolls around to introduce all things Merry and Bright, and wish you and your families a wonderful Thanksgiving full of gratitude and grace! However, once December is here, we'll be ringing it in with a bang! Since there's no December release, we are finding our muse in a different way…with all of YOU! WHAT: An all-customer HOLIDAY HOP! WHEN: Monday, December 2nd, at 12:00 NOON (CST). WHERE: The TGF BLOG, and your blogs! Visit our TGF Facebook page starting TOMORROW (Saturday 11/23) at 10am CST. We will have a SIGN UP where you can leave your BLOG ADDRESS/URL. All participants must be willing to have their posts up at 12:00 noon CST, as this will be a large hop and there will be a lengthy list created to post all of the blogs in one place for you to scroll through. (if you do not have a FB account, email Jess). SIGN UP deadline is THANKSGIVING DAY. Because of the preparations, we can not take any signups past 11:59pm CST on Thursday, November 28th. We will be giving away a $25 gift certificate to one RANDOM winner who participates in the hop, along with a 2nd prize of a 4x6 set, 3rd prize of a single rubber set, and some 'honorable mention digis' for creativity and design at the discretion of the Design Team. We are SO excited to make the season BRIGHT! Hope to see a TON of you sign up for this! It's time to make (wrap) something for a special someone. 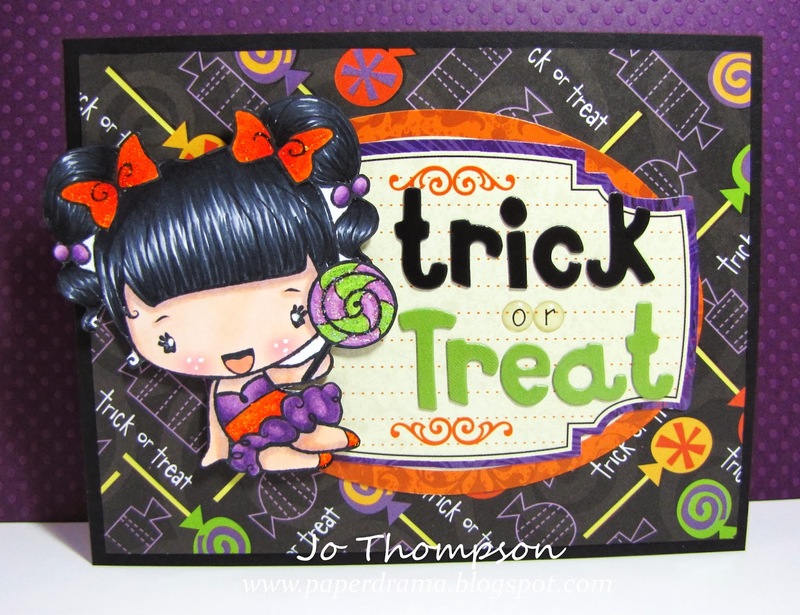 Here is a Takeout Treat Box I decorated using Frou Frou Sweet on a tag. She is colored with my Copics and glittered with Stickles. The takeout box is from a restaurant that I asked for extra and didn't use LOL. I wrapped some red striped ribbon around the box. You can fill up the box with baked goods, chocolates or whatever you want. Happy Sunday! Today I'm sharing a card that I made using Digi Dollie with Ice Cream from The Greeting Farm. She is one of three that was released this November. They are just so pretty and cute. I colored her with my Copics and I drew some stripes on her socks with a white gel pen. I cut out a snowflake using the TGF Snowflake Die, I went with red cardstock instead of white, I just thought it would match and stand out better. Dollie is holding ice cream, but I thought it would be cute to make it into a snow cone to kinda go with a winter theme. The "Snow Fun" sentiment is from a mini dollar stamp a couple years ago. I added some Stickles on the snow cone and also on her outfit. Thanks for stopping by and have a great day/week! It's Farm Fresh Friday today at The Greeting Farm. The challenge for this one is Washi Tape/Tape Stamps. Here, my Washi Tape is an image from the My Heart set. 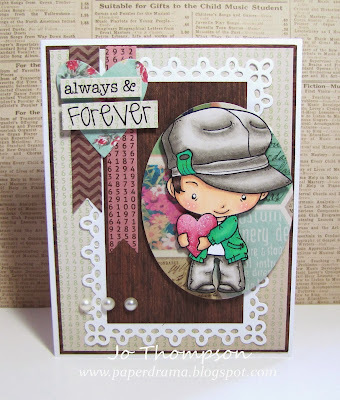 I stamped it using Rich Cocoa Memento Ink and then fussy cut the image. 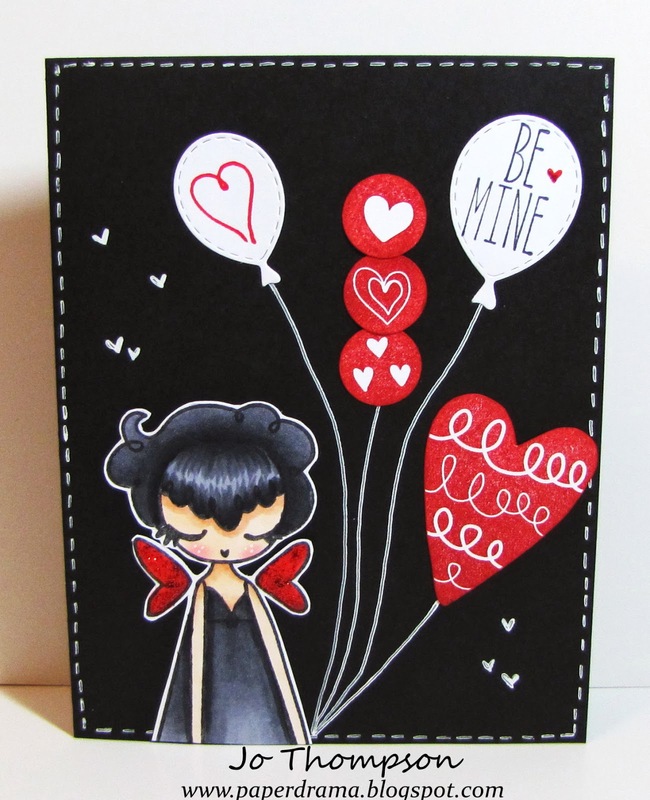 The hearts are also from the stamp set. I stamped them in red ink and cut them out. The hearts are then glued on some twine string. I had a new wood grain embossing folder and wanted to use it. That is the texture you see in the background. 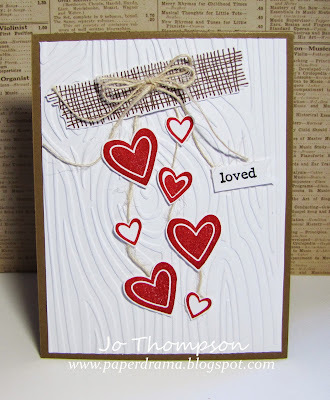 The mini "loved" sentiment also is from the stamp set. I kept this card simple today. Hope you like it and that you join us over at the TGF Blog. Hi guys! Happy Wednesday! 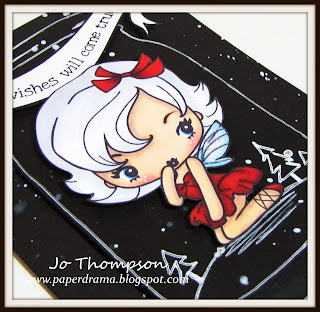 Here is a card for you using the NEW TGF Dollie Digis. CUTENESS overload! She is colored with my Copic markers and I added some Stickles for sparkle. She has the cutest face and outfit. 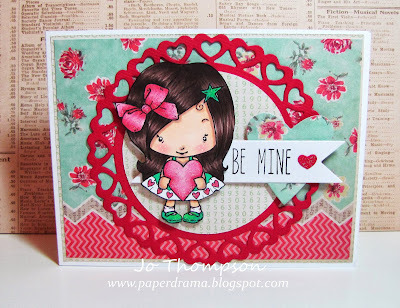 The "Be You" die cut is from the paper stack that I used. I added some seam binding and flowers. There's nothing much to say about this card but I am definitely will be using her again. Thanks for stopping by, enjoy your day! 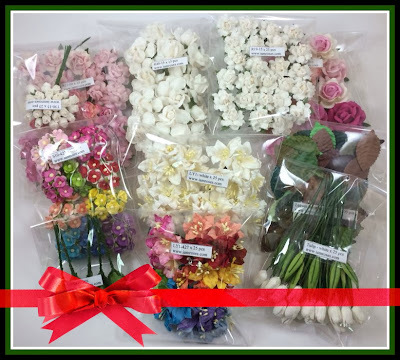 It's a new challenge over at the I Am Roses Challenge Blog: Featured Flower - Designer's Choice. My choice of flowers are the Small Daisies (D2). I created this Fall themed card. The Small Daisies are measured approx. at 1". They come in a variety of colors, I used the tangerine color. You can see the difference between the regular sized Daisy vs. the Small Daisy. 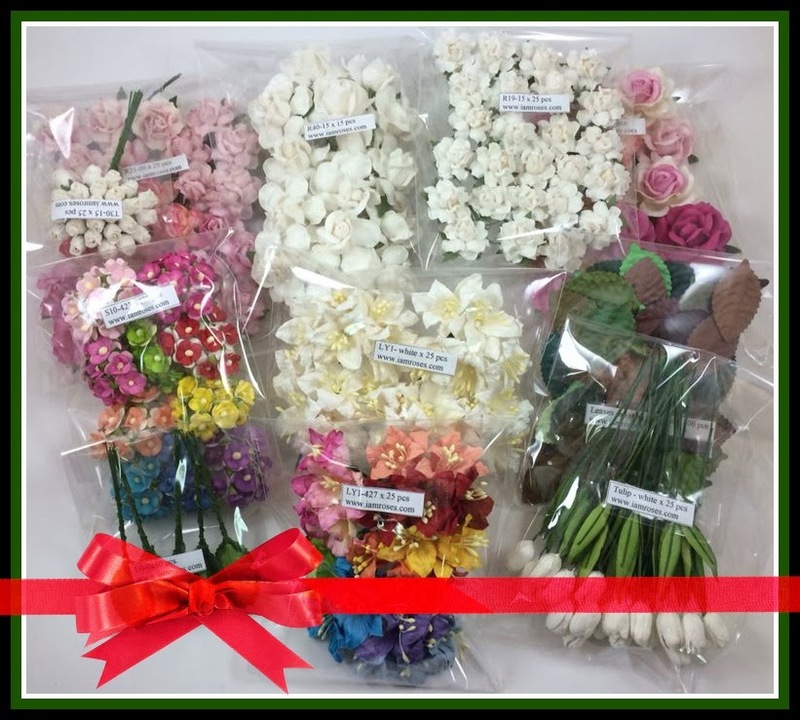 I added an assortment of Tiny Rose Buds and Small Semi Open Rose Buds, as well as .25" roses. I layered all of these on top of a mixture of colored Maple Leaves. The Small Daisies are the perfect fillers for your cards and they coordinate with any flower, in my opinion.